TI’s Stellaris LaunchPad board, which I reviewed recently comes with an out of the box demo program called qs-rgb. This program allows you to test the LaunchPad board and also try out some of the features of the LM4F120 MCU that is present in the board. When you buy the board, it comes pre-installed with the program and you don’t have to do anything. If you have already flashed another program into the board, then you have to re-flash the gs-rgb program, which you can find in the samples folder. To run the demo program, you should connect the micro-B USB cable to the debug port of the board. The debug port is present at the top of the board. After connecting the cable, slide the slide switch towards right (You can find this switch at the top left corner of the board). Once it is connected, power the board by connecting the A (large) side of the cable to a USB port on your computer. When you power on the board, the RGB LED (which is present in the right side of the board) will start to glow and will scroll through the color spectrum. If you press the left user button (present towards the bottom of the board, marked as SW1), then the LED will scroll towards the red end of the color spectrum. If you press the right user button (marked as SW2), then the LED will scroll towards the violet end of the color spectrum. The LM4F120 chip in the board supports hibernation mode and you can test it out as well. Press both the left and right user button together for 3 seconds and the MCU will go to hibernation mode. In the hibernation mode, the RGB LED will blink for 0.5 seconds for every 3 seconds with the last color. You can press reset button to wake up the MCU. The board comes with ICDI (In-circuit Debug Interface) and it provides a virtual serial port, through which we can communicate with the target processor. You can interface with the processor by connecting to this virtual serial port. In Ubuntu you can find the virtual serial port by using the following command. From this I know that the serial port is /dev/ttyACM0 in my machine. If you are on Windows, I think you might have go to Device Manager to find the port. Once you have identified the port, you can connect to it using terminal program like screen (or Putty if you are in Windows). While connecting you have to use the following configurations. And then I pressed the reset button in the board to get the following prompt. You can type help to the list of available commands. 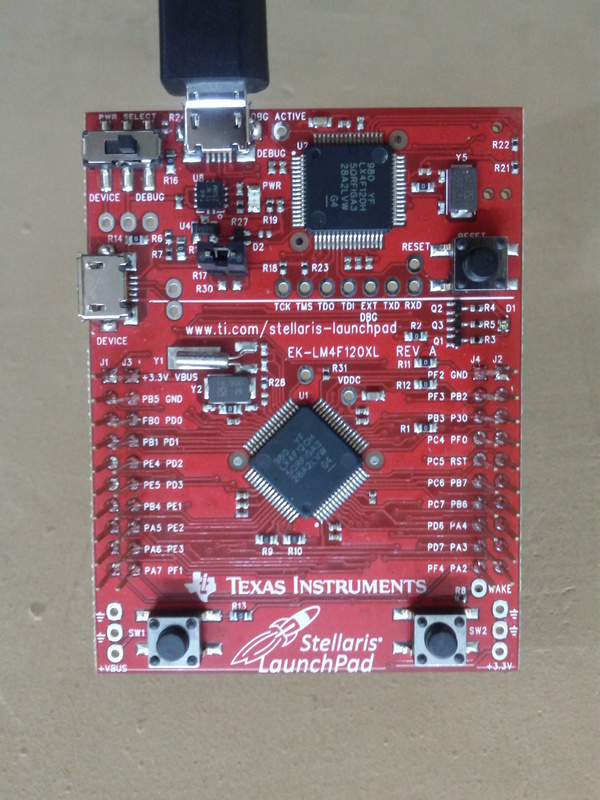 Welcome to the Stellaris LM4F120 LaunchPad! You can try out the listed commands as well, which allows you to control the RGB LED. This entry was posted in Tutorials and tagged LaunchPad, LM4F120, Stellaris, TI on December 9, 2012 by Sudar. 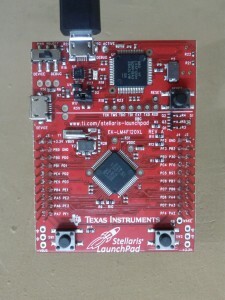 I finally received the Stellaris LMF120 LaunchPad from TI, which I ordered in September. I haven’t started playing with it yet, but thought of posting about my thoughts of the board after having the first look. The first striking feature of the board is that it has two LM4F120 chips. I guess one of them is used for on-board emulation, but I am not sure yet. There is also a device/debug switch on the board. The board also had two micro-B USB ports. I guess one is used for debugging the board and the other is used for connecting additional devices to the board. The board also has a couple of buttons (I guess one of them is the reset switch), a RGB Led, two crystals, a current measurement jumper and couple of other components. The GPIO pins are broken out into male pins (like Arduino) and they are pointing upwards. I suspected that it is for some kind of extension and then realized that Launchpad have an extension system called Booster Packs which is very similar to the concept of shields in Arduino. While visiting the link given in the getting started card, I came to know that TI conducts regular workshops which allows you to get started with Launchpad development. You can sign up for it from TI’s website. I am planning to attend it when I get some free time. You can checkout some more pictures of the board at Flickr. On the whole what I have got so far is definitely worth more than $5 which I paid for the board. I just ran the demo program in Stellaris LM4F120 LaunchPad. This entry was posted in Reviews and tagged LaunchPad, LM4F120, Review, Stellaris, TI on December 5, 2012 by Sudar.